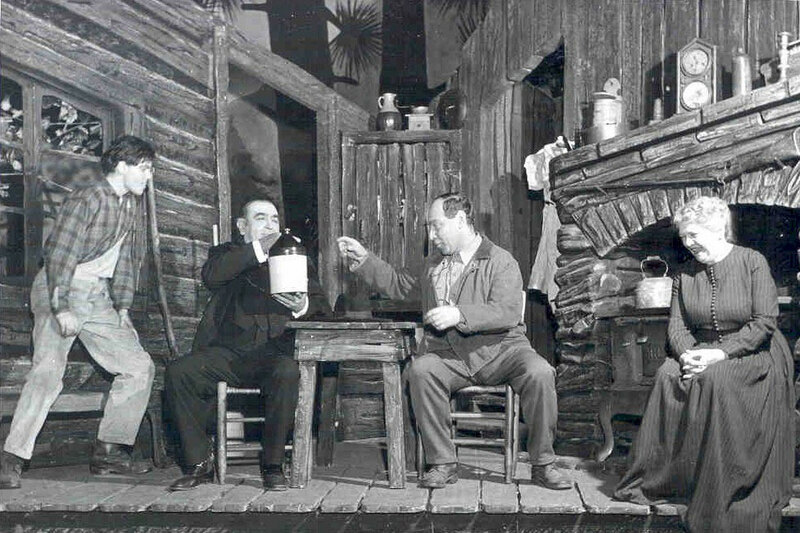 Broadway Production of "The Dark Moon"
Preacher: "There ain't a man in the church can make corn liquor as good as you." Pa Allen: "Comin' from you preacher that's mighty fine praise." Sherod Jennings Collins (1900-1981), son of Madison Franklin and Belle (Whitworth) Collins, was born March 5, 1900 in Putnam County, MO. From 1918 till 1930, Collins taught in rural schools while attending school part-time himself. He enrolled as a full time student at Northeast Missouri State Teachers College (now Truman State University) in 1930 and two years later received his BS with a double major in Speech and Political Science. For the next five years he worked on his MA in Psychology of Education at the University of Missouri while serving as Superintendent of the Queen City, MO High School. He then joined the NMSTC faculty as speech instructor and director of debate in 1937, retiring in 1969 as Assistant Professor of Speech. He died May 18, 1981 in San Antonio, TX. Collins spent the summer of 1942 doing additional graduate work in drama at the University of Iowa. While there, he had a role in "Dark of the Moon", an experimental drama based on the folk ballad "Barbara Allen", by Howard Richardson and William Berney. Two years later, the authors asked him to take the role of "Pa" Allen in the Lee Schubert Broadway production which was to go into rehearsals that December. Collins accepted and took a leave of absence to appear in the production in Philadelphia, Washington DC, Boston and New York; he returned to the role for four months in 1946. While on leave, Collins corresponded with his NMSTC Speech Department colleague Clifton Cornwell (1895-1965) who later donated the letters and memorabilia he received to Pickler Memorial Library. Photocopies of correspondence in President Walter H Ryle's file for Collins were later added to supplement the collection. ▪ Draft of press release re Collins' background and involvement in "Dark of the Moon"
Richardson, Howard and William Berney. "Dark of the Moon". The Drama Library. New York: Theatre Arts Books, 1974. Collins, Sherod J. "Breaking New Ground: Autobiography". Kirksville: Simpson Publishing Company, 1969.